This year for Halloween, we're having a pumpkin hunt. 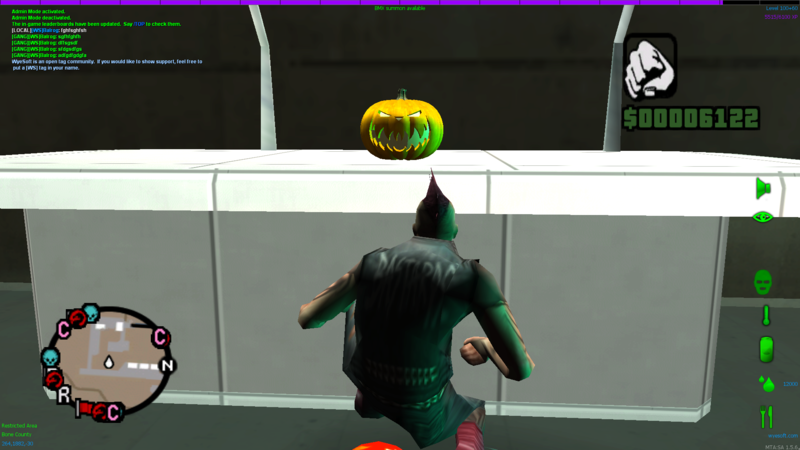 13 pumpkin jack-o'-lanterns have been hidden around San Andreas, similarly to the blue packages. Some are outdoors and others are in interiors. You will receive 25 shop points and 30 minutes of double XP time for each pumpkin that you find, and you'll get the "Happy Halloween!" achievement when you find the first one. If you find them all, you'll be rewarded with 3 loot crates and the "Pumpkin Pie" achievement. Since I've left this so late and most people will need more time to find all the pumpkins, this event will extend past Halloween and end at 7 AM (server time) on 7 November. This will probably be an annual thing though and, from next year onwards, you should expect it to start on 17 October and end on the morning after Halloween, giving you 2 weeks to find them all. Here's an easy-to-find one, so that you know what to look for . . .